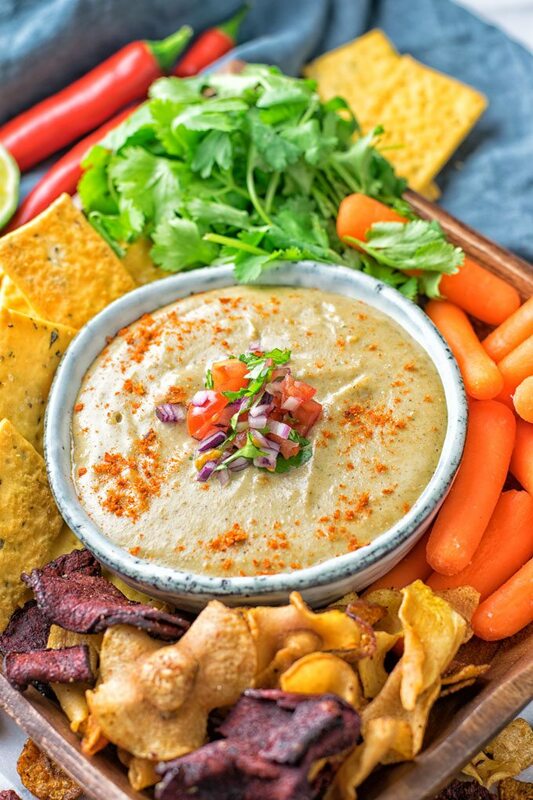 My new Mexican Cheese Dip is vegan and gluten free. It has full flavor with a note of cloves and comes together from just 5 ingredients and in 2 easy steps. Friends, I have a new cheese addiction for you. 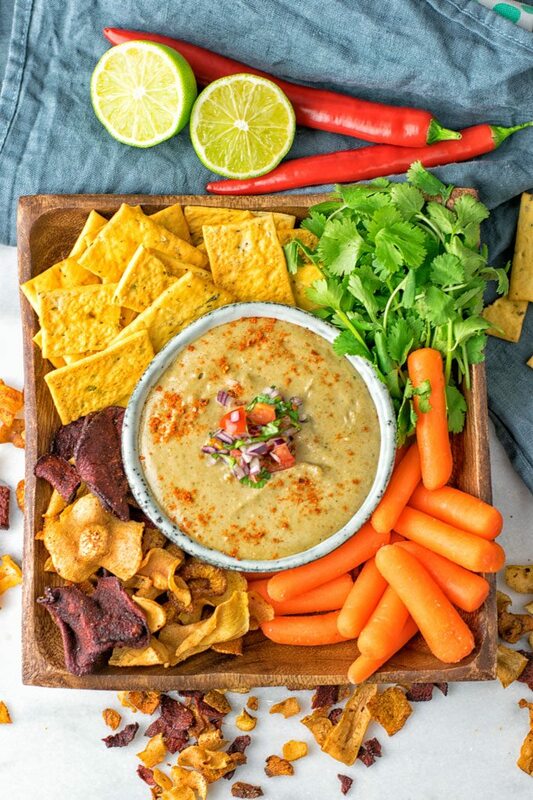 It’s here with this Mexican Cheese Dip, so grab your veggie sticks and chips and we can dig right in. I’m really excited for today’s post. We all know, we can always buy our Mexican Cheese at the grocery store. But let’s be real friends, whatever it is, it’s most likely not vegan. And to make matters worse, of course you will find a long list of weird ingredients. So many words of which you don’t know what is it! What is inside? But with my recipe, you definitely know what’s in. All is homemade, so it’s a win-win, right. And after a lot trial and error for you guys, I can happily confirm this is seriously the best Mexican Cheese Dip I’ve ever eaten. Before vegan days, I was an ardent cheese lover. Cheddar, mozzarella, cream and goat cheese, to name only some of my favorites. Of course when I became vegan, all of this wasn’t available to me any more. Luckily, I learned how to make vegan cheese homemade on my own. That is not always easy, but whenever I create a new cheese recipe for you friends, you can be sure I tried to get really close to the real deal. Check out the Easy Vegan Pimento Cheese, or my Roasted Garlic Vegan Cheese Fritters, while you are here! Not only is this new recipe a reflection of my love for cheese. It is also a tribute to my fondness of Mexican food. You have already seen so many of my recipes, like my Mexican Fiesta Cauliflower Rice, or the Quinoa Taco Salad [vegan, gf], to name just two. This new recipe for my Mexican Cheese Dip is no exception. My expectations were high like for every recipe which I post here. I only post recipes which are approved and will work for all of you. Now it’s time to get excited. Sit down with a big bowl of veggie sticks in your hand and let’s get going. 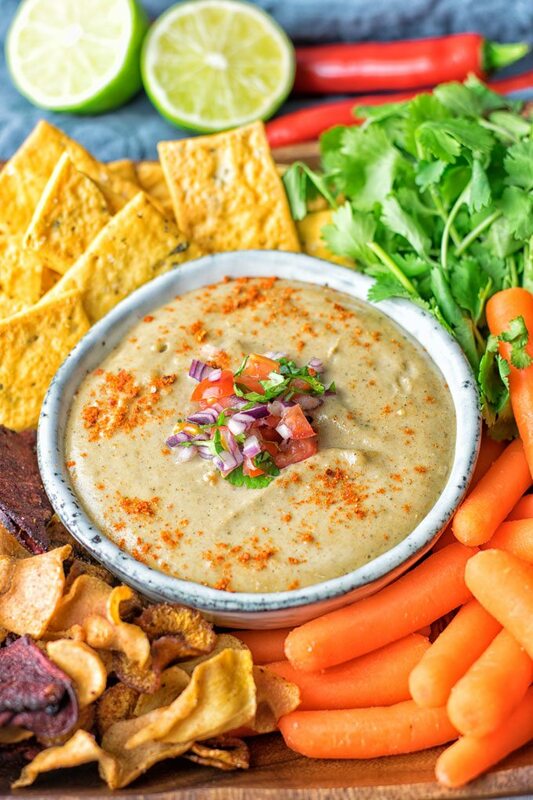 Make this dip and the result will be creamy, flavorful, tangy, satisfying, cheesy, addicting, mouthwatering, spicy, and just so incredible delicious. Ok friends let’s get started with this flavor wonder, shall we? Prepare a batch of the vegan cheese sauce as I used it for my Broccoli Cheese Vegan Pizza according the instructions but reduce the amount of vegetable broth to 3/4 cup. This is important, otherwise the dip will turn out too liquid and we really want a nice dip consistency. And that’s almost all you need to do. Because the next and last easy step is just adding the ingredients to the bowl of a blender. Process until the dip is really creamy and smooth, done. 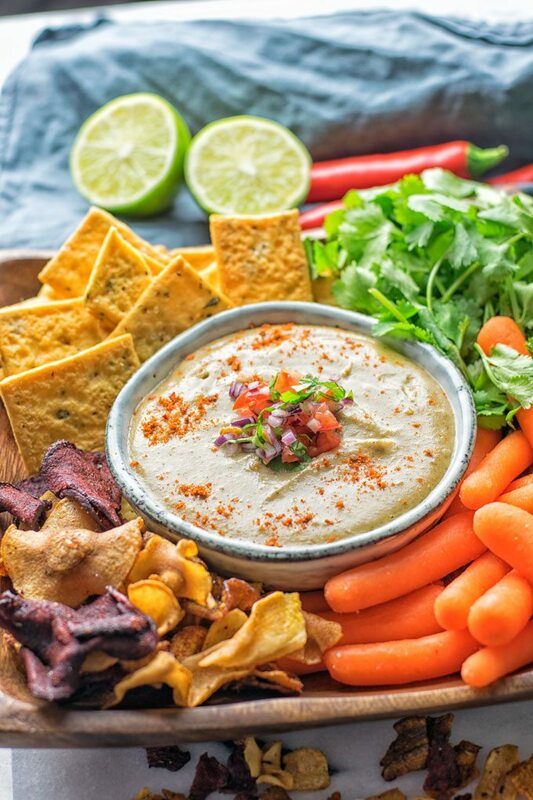 Friends this Mexican Cheese Dip is not only incredibly delicious and tasty, it’s a flavor star thanks to some Mexican spices like cumin and ground clove. And of course the dip gets a real tang by the use of lime, which goes perfectly with the spicy and cheesy flavors here. 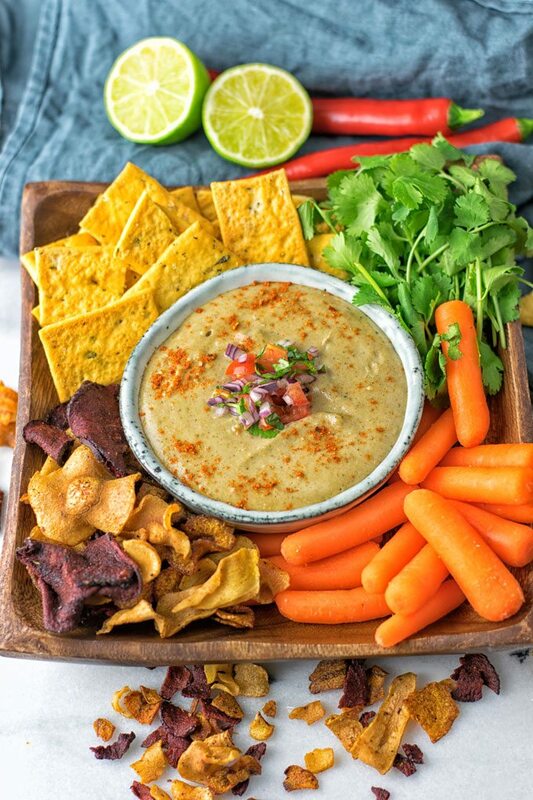 This Mexican Cheese Dip makes an amazing condiment for an appetizer. Just serve it with some roasted veggies or your favorite chips and you really know you need more of this. I’ll warn you so be aware if you ever try this dip you won’t resist, it can be happen that you will make this again and again. And if you are curious about more Mexican spices don’t forget to look at this article “A guide to Mexican herbs & spices“. 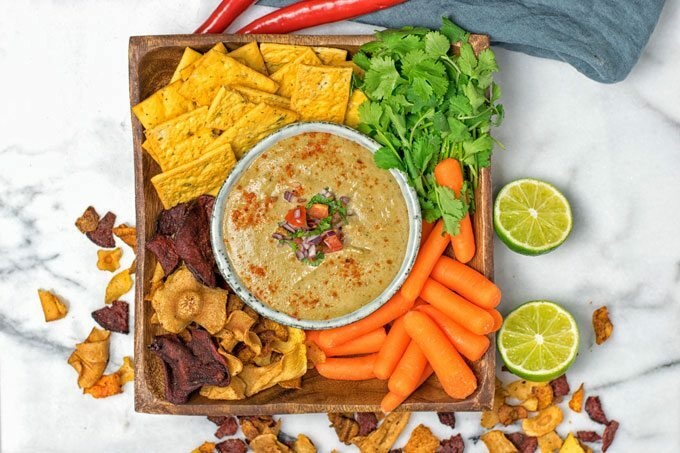 If you try this, dive into it, prepare your veggie sticks and chips and enjoy. Give me tag on Instagram and Facebook so I can see all your amazing creations. Where are my chips? I need to make another batch! Cheers, Florian. 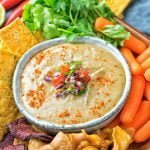 Prepare a batch of my Vegan Cheese Sauce according the instructions but reduce the amount of vegetable broth to 3/4 cup. This is important, otherwise the dip will turn out too liquid and we really want a nice dip consistency. Add all the ingredients to the bowl of a blender. Process until the dip is really creamy and smooth, done. I’m wanting to make this tonight but I’m confused by the water part…. I didn’t see water listed in the instructions on the vegan broccoli pizza or the vegan cheese page. Maybe you mean the veggie broth?? Hi Bernadette! Yes, indeed I mean the veggie broth. Thanks for spotting this, I’m going to correct that.